Hey I’m Minha and I’m from Danville, CA! I’m majoring in business with a minor in political science. I joined hall government in hopes of making this campus a better place for everyone. I want to hear everything and anything all of you have to say! I live on the first floor and we’re open 25/8, so come stop by. I love kid cudi, asap rocky, and lil yachty, so hmu if you wanna go to a concert some time! My name is Vincent Cardenas. I am the vice-president. I am from Benicia, California and I am majoring in Software Engineering. I chose to join Hall Government because I wanted to experience being on a leadership team since I knew a lot of people who did ASB in high school. On my free time, I enjoy going on adventures with friends, photography, and eating good food. I am always down to try new food and explore so hit me up! Hi! I’m Jay and I serve as the CVC Secretary. I come from Gilroy, CA, the Garlic Capital. I’m intending to major in Econ, but hey going with the flow so it’s subject to change. When I’m not studying, I am probably watching “The Office” or blowing through money for food in downtown (good thing I’m not the treasurer haha). I’m excited to get to know you guys so come up to room 424 and chill. Spartan Up! Hello Spartans! My name is Pardeep Kaur and I am a freshman majoring in business with a concentration in accounting. I come from a small town named Hollister(no not the store LOL). Since I’m an accounting major taking on the position of treasurer was the best way for me to gain experience. Throughout high school I have been doing community service at my local hospital and church and took part in ASB, Girls Inc, Link Crew, and lots of other clubs. I’ve always enjoyed getting involved, meeting new people, and building connections with others. During my free time I like to go to the beach, take pictures, or go find new places to eat in Downtown San Jose! If you ever want to join let me know! Hey! I’m Gurlean, the historian this year. I’m from Hollister… no, not the store. I’m a business entrepreneurship major here at SJSU so don’t be surprised if I become the next Steve Jobs. I chose to be on Hall Government this year because I wasn’t involved in my tiny little high school so I wanted to take this opportunity to change that. While in high school though, I volunteered at a hospital for three years, taught as a Sunday school teacher for four years and have been super involved in a local Sikh organization called Jakara. Besides all that professional stuff, I love the beach, nature and skylines. Oh! I also love good music so if you’re ever up for an adventure, let me know bc I’m always down. Hey everyone! 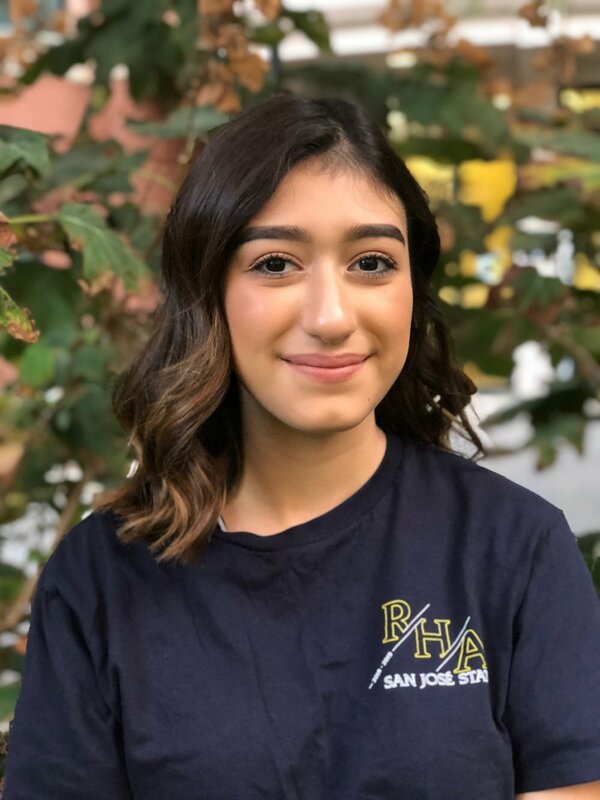 My name is Asmita and I am one of the RA Liaisons for CVC. I am currently a senior pursuing my degree in Business Analytics with a minor in Applied Computing. Some of the things I am passionate about include: going to viewpoints, concerts, spending time with family and friends, and working with children.